Helene, a 32-year old recently divorced teacher, signs up for one of those horrible wildness experiences that's supposed to test how tough you are (spoiler alert about me: hahahaha, this whole notion horrifies me). She heads off to Wyoming with her much younger brother's best friend in town--much to her disappointment, he signed up for the same wilderness adventure. So much for finding herself where no one knows her. The expedition is harder than Helene ever imagined. They face fluke blizzards, injuries, and days and days of rugged terrain with their demanding, jerkface of a trek leader. But--no surprise--along the way Helene finds out a lot about herself and a little bit about Jake, her brother's annoying best friend--if you know what I mean. Yes, this is a pretty typical story, but I enjoyed the hell out of it. First of all, I know "relatable" is a bad word in the online bookish community right now, but Helene will be infinitely relatable to anyone who's challenged themselves to do something that really scares them. She's kind of a whiner, but in a way that makes her more normal--she's not all that special, and she really, really struggles, completely underestimating just how hard this process will be. 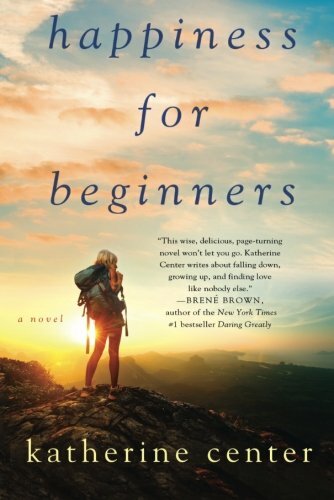 Happiness for Beginners also has a touch of reflection that doesn't feel heavy-handed like happens too often in books in the "women's fiction" genre--it feels, again, relatable. Helene ponders what will make her happy, and how to find that within herself. Like many people in her age group, she's spent a lot of time looking for happiness from external forces: people, experiences, but in reality, happiness is very much an internal thing, and Helene's journey contemplates that in an insightful way. Pick this one up if you're looking for a quick, fun read with a surprising amount of warmth and heart. Recommended For: Fans of Liza Palmer's novels and people who'd rather read about camping than actually subject themselves to such nonsense.